OXFORD, Ohio – A weekend that started off with so much promise turned into a pair of mistake-laden losses that have a Miami team that showed so much promise in the opening weeks skating backwards. 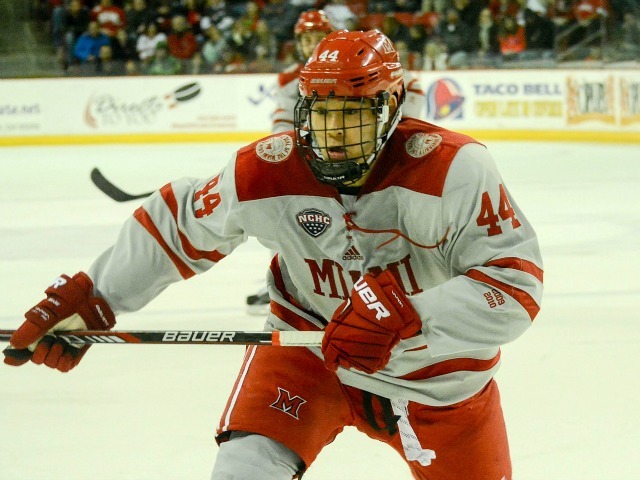 The RedHawks led 4-1 on Friday before allowing the final five goals in a 6-4 loss and were beaten soundly, 6-2 at Cady Arena on Saturday after rallying from two down to tie the score. MU (3-6-2) netted four of the first five goals this weekend but surrendered 11 of the final 13. The RedHawks have allowed 23 goals in their four NCHC games – or 5.75 per contest – as they have dropped to 44th in the NCAA in overall team defense. Most disturbing is special teams, as Miami was tops in college hockey on the PK a couple of weeks ago but has given up nine power play goals and two more shorthanded in the last four games, killing penalties at an anemic 65.3 percent clip. The most important stat is wins and losses, and Miami has dropped its last five, getting outscored 11-0 in the third period during its current skid. The absence of Louie Belpedio has hurt this team on several fronts, as the RedHawks were 3-2-2 with him in the lineup and 0-4 since. Without their captain, they seem less focused, the compete level has been inconsistent, and paramount is the loss of 20-plus minutes of play from their best all-around defenseman. And the latter has a trickle-down effect, as everyone gets bumped up a spot in the D pecking order, and as a result the entire group has had its struggles. Of course it doesn’t help when starting goalie Ryan Larkin goes down with an injury, or that stud freshman Carson Meyer may miss several weeks. No one will feel sorry for Miami, especially not No. 1 Denver, the team the RedHawks play next weekend at altitude after getting drubbed in five straight third periods. We’re already one-third of the way through the regular season, and Miami needs to turn this thing around fast or we could be in for a very long winter. – Like Friday, the RedHawks again allowed too many players to skate into the slot uncontested. Snuggerud was left alone for the third UNO (6-3-1) goal. He scored again by beating Scott Dornbrock to the net for a backhander. The physical game got away from Miami entirely this weekend, especially around the net. The RedHawks might as well have placed a welcome mat in orange and black at the top of their crease both nights. – Let’s insert some positive: Despite everything that’s happened in six weeks, Kiefer Sherwood continues to get better every game. He dominates play for portions of games, not just with his shot but with puck possession and high-level passing. He’s a certifiable nightmare on the power play, as defenders have to come out to protect against his shot, opening up other avenues for Miami. – Speaking of the power play, Coach Enrico Blasi went with five forwards numerous times with Josh Melnick at the point. He obviously trusts the defense of Melnick, who effectively ran the point, but without Belpedio it may be his way of saying none of the other D-men have earned that high-profile playing time. Miami did allow two SHGs this weekend, although neither were the result of his five-forward units. And using that many forwards on the first unit leaves even fewer offensive-minded bodies up front for the second line, which has been mostly ineffective this season. – If UNO is in the bottom half of this league, the NCHC is absolutely loaded. This is a very good team, and not surprisingly is well coached by Dean Blais. FORWARDS: D+. Sherwood has two rips for goals and these guys showed some signs of life but did little on a five-minute power play in the third period and combined for just 21 shots despite 13 minutes of power play time. On a positive note, Melnick and Justin Greenberg were much better on faceoffs, an area in which Miami has struggled seemingly since Pat Cannone and Carter Camper graduated. DEFENSEMEN: D-. Without Belpedio this group is contributing almost nothing offensively and are committing too many egregious turnovers. Normally-reliable Grant Hutton had a miserable weekend, including a giveaway that directly led to UNO’s second goal. Dornbrock got beaten badly on Goal No. 6. The Mavericks finished with just 26 shots, but too many were high-percentage chances. This group needs to get a lot better, especially in front of its own net, and that needs to happen quickly. GOALTENDING: D+. Six goals against, it’s easy to blame goaltending, but Chase Munroe faced a ton of A-plus chances in his starting debut. Three of his goals against were on the power play, including a 5-on-3 tally. The first was on a PP scramble in front of the net, the second was basically a 2-on-0 on a power play, No. 3 was scored after yet another player was left open in the slot, the fourth was a 5-on-3 but was probably the one Munroe would’ve most likely wanted back, No. 5 was a breakaway and the sixth was on a player crashing the net, and Munroe was unable to hold the post. Certainly not a memorable debut but he was not the reason Miami lost. LINEUP CHANGES: Munroe for Larkin was the most notable. The only other switch was Bryce Hatten in basically the sixth defense spot in favor of Chaz Switzer. 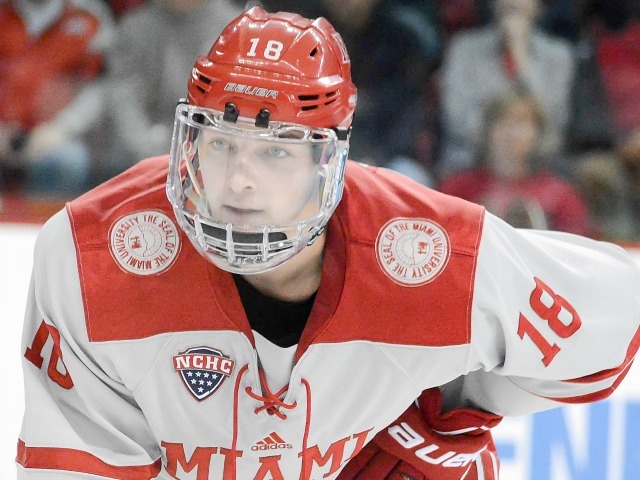 OXFORD, Ohio – In a 1:50 span of the first period, Miami erased a two-goal deficit on two blasts by Kiefer Sherwood. 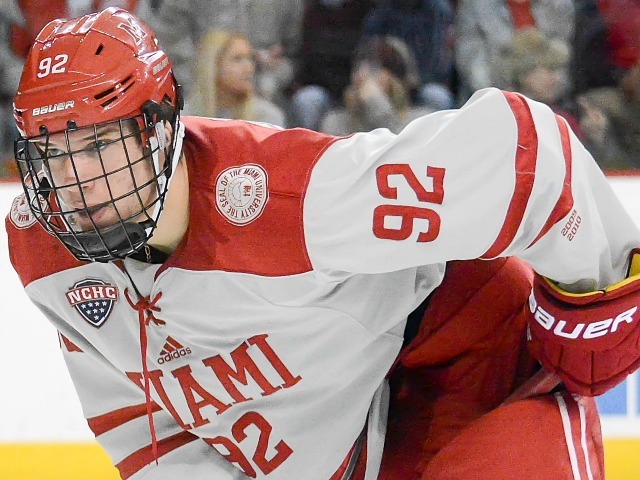 But over the final 40 minutes, Nebraska-Omaha netted four unanswered goals en route to a 6-2 win over the RedHawks at Cady Arena on Saturday, spoiling MU goalie Chase Munroe’s first collegiate start and extending Miami’s losing streak to five games. 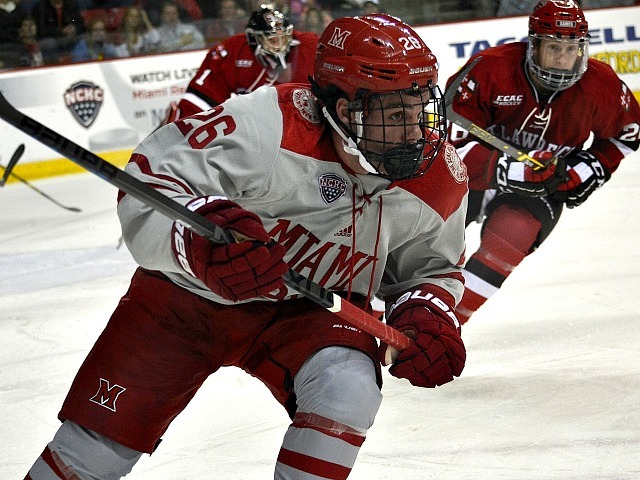 The RedHawks (3-6-2) have allowed 23 goals in their last four games. Only two of the eight goals were scored at even strength. UNO (6-3-1) opened the scoring on the power play, as the Mavericks won the draw and a pass found Teemu Pulkkinen in the high slot. Pukkinen backhanded one on net, got his own rebound and slid across to Mason Morelli for a slam-dunk goal 6:15 into the first period. Nebraska-Omaha extended its lead shorthanded less than seven minutes later when RedHawks defenseman Grant Hutton had a defensive zone pass intercepted, and David Pope and Austin Ortega played give-and-go for a tap-in goal by Ortega. Miami responded with 4:58 left in the opening period on the power play when a shot by Anthony Louis hit a body in the slot and ricocheted to Sherwood, who fired it into the top corner from the left faceoff circle. Sherwood scored from nearly the same spot 110 seconds later, again on the man advantage, on a set-up pass from the point by Josh Melnick, tying the score. But after that the game got away from the RedHawks. Ian Brady centered a pass to Luc Snuggerud, who skated around Miami goalie Chase Munroe and deposited the puck in the net to give UNO a 3-2 lead 7:20 into the second period. The Mavericks again took a two-goal lead just over two minutes later on a 5-on-3 slap shot by David Pope from the center of the faceoff circle. Tristan Keck sprung Ortega loose for a breakaway, and Ortega pulled up and slid the puck under Munroe to make it 5-2 with 15:12 left in regulation. Snuggerud capped off the scoring when he pitchforked one through Munroe three minutes later. Sherwood has scored four goals in his last four games, and Melnick, Louis and Brandt all picked up assists for the second straight contest. Carter Johnson recorded the other helper. Ortega and Snuggerud both ended the night with two goals and an assist. In addition to struggling on the ice, Miami’s injuries are also piling up. Goalie Ryan Larkin, who had started the first 10 games, was out with an upper-body injury, and it is unclear when he will return. Forward Carson Meyer, the RedHawks’ freshman points leader with 10, missed the entire weekend with an illness and could be out multiple weeks. And defenseman and captain Louie Belpedio missed his fourth straight game with a lower-body injury and had a noticeable limp when he walked around the concourse, but he is expected back next weekend. Miami is now 0-4 in NCHC play. The RedHawks’ next four games will be on the road, with their first two coming at Denver on Nov. 18-19. OXFORD, Ohio – Miami came within 24 minutes of snapping a three-game losing streak. Anthony Louis celebrates after scoring a second-period goal (Cathy Lachmann/BoB). But the RedHawks, who led by three goals with four minutes remaining in the second period, allowed five consecutive goals down the stretch in a 6-4 loss to Nebraska-Omaha at Cady Arena on Tuesday. The Mavericks (5-3-1) jumped on top early, as Mason Morelli tipped in a blue line shot by Ian Brady just 7:21 into the first period on the power play. After that, it was a game of runs, as Miami (3-5-2) scored the next four goals. The RedHawks tied it with 3:29 left in the frame when Anthony Louis carried the zone, skated along the boards and centered a pass to Josh Melnick, who one-timed the puck home from the high slot. Miami took the lead on an innocuous wrister by Scott Dornbrock from along the boards that Conor Lemirande redirected home 6:23 into the second period. Dornbrock picked up another assist when he slid a pass to Louis in the high slot, and Louis buried a shot to the stick side for his 100th career point with 10:09 remaining in the frame. Just 34 seconds later, the Louis penetrated uncontested and roofed a backhander from the center of the faceoff circle on the short side to make it 4-1. But UNO cut the lead to two prior to the second intermission, when Steven Spinner stole a Louis pass, skated the length of the ice along the boards and connected with trailing defenseman Joel Messner, who buried a shot to cut the deficit to two. Jake Randolph made it a one-goal game 83 seconds into the final stanza on a tip-in off a blue line wrist shot by Messner. The Mavericks tied it when Spinner picked off a Melnick pass in the neutral zone, skated in and went top shelf for a shorthanded goal with 14:13 left in regulation. That ended the night for Miami goalie Ryan Larkin, the RedHawks only goalie used this season to that point, as he gave way to freshman Chase Munroe, who made his MU debut. Munroe was greeted rudely, as Luc Snuggerud’s slap pass from the blue line found the blade of David Pope’s stick for a redirection goal that gave UNO a 5-4 lead with 8:05 to play. The Mavericks sealed it when Morelli scored an empty netter after Austin Ortega intercepted a Louis centering pass from behind the net. The RedHawks have surrendered 17 goals in their last three games and have been outscored, 9-0 during their current four-game skid. Louis finished with three points, giving him 101 for his career and a team-high 14 on the season, including a Miami-best nine goals. All of his points have come in the last eight games. Melnick recorded a goal and an assist for his first multi-point game of the season, and Dornbrock ended the game with a pair of helpers, his first two-assist game since Jan. 29. 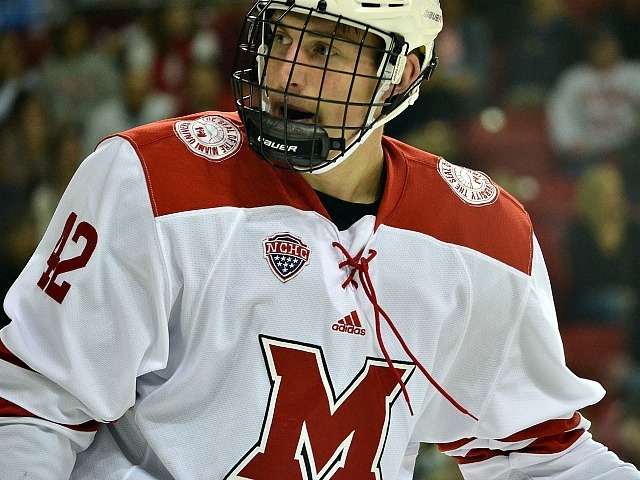 Miami drops to 0-3 in the NCHC. The series finale will be at 7:05 p.m. on Saturday. Nebraska-Omaha struggled down the stretch and ended up finishing 8-15-1 (.354 winning percentage) in the NCHC, taking sixth in the conference in 2015-16. 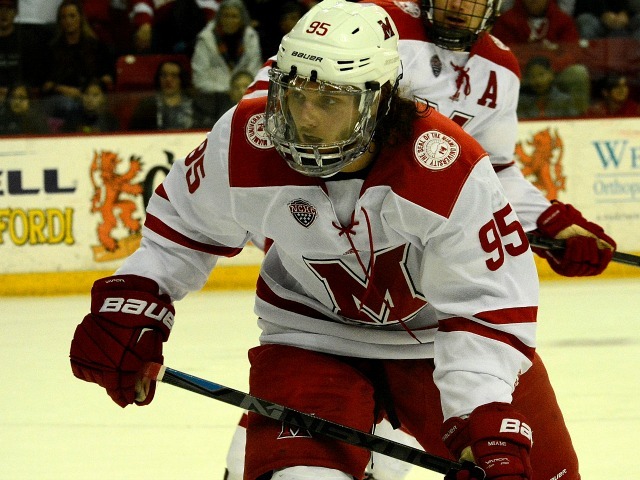 The Mavericks tied Miami in Oxford Nov. 20, but the RedHawks would claim the extra point in the NCHC standings on a Louie Belpedio rebound goal in the series finale the next night. UNO finished the year 18-17-1 (.514), taking sixth overall and was eliminated from the NCHC Tournament in the first round, as the Mavericks were swept by Denver. COACH: Dean Blais (8th season, 129-116-25, .524 winning percentage). 2015-16 RECORD: 18-17-1 (8-15-1, sixth in NCHC, .514 winning percentage). POSTSEASON RESULT: Swept by Denver in the first round of the NCHC Tournament. RINK (capacity): Baxter Arena, Omaha, Nebraska (7,898). LAST SEASON VS. MIAMI: 1-2-1 (In Oxford Nov. 20-21, 3-3 tie, 3-2 win/ In Omaha Jan. 22-23, 3-1, 7-3 losses to the RedHawks). ALL-TIME SERIES: Miami leads, 18-11-4. SCHEDULE VS. MIAMI: In Oxford Nov. 11-12; in Omaha Jan. 20-21. 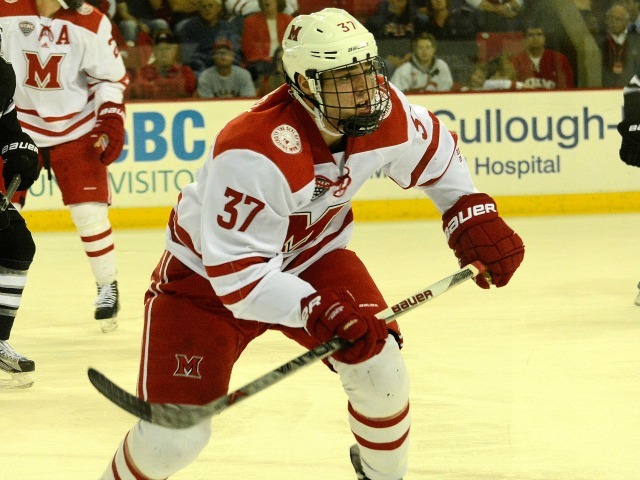 TOP RETURNING PLAYERS: F Austin Ortega, F Justin Parizek, D Luc Snuggerud (141st overall pick by CHI in 2014). 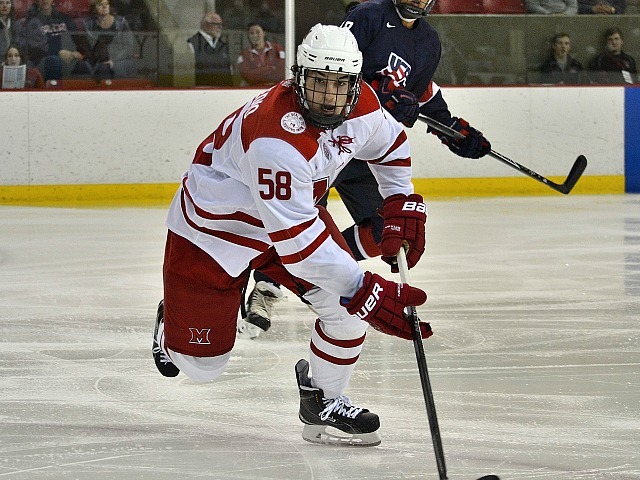 KEY NEW FACES: F Colin Grannary (Delta, British Columbia/Merritt-BCHL), D Ryan Jones (Crown Point, Ind./Lincoln USHL), G Kris Oldham (TBL 153rd pick in 2015). NOTES: Nebraska-Omaha has finished third, third and sixth in the eight-team NCHC in three seasons. The Mavericks scored 103 goals last season, the top scorer, Jake Guentzel, who has graduated, notched 19 goals in 35 games, while dishing out 27 assist. Austin Ortega is the team’s top returning scorer with 36 points, including a team-best 21 goals, and Ortega was first on the team in power-play goals (seven). The Mavericks blue line stays well intact as the team returns all but one defenseman. 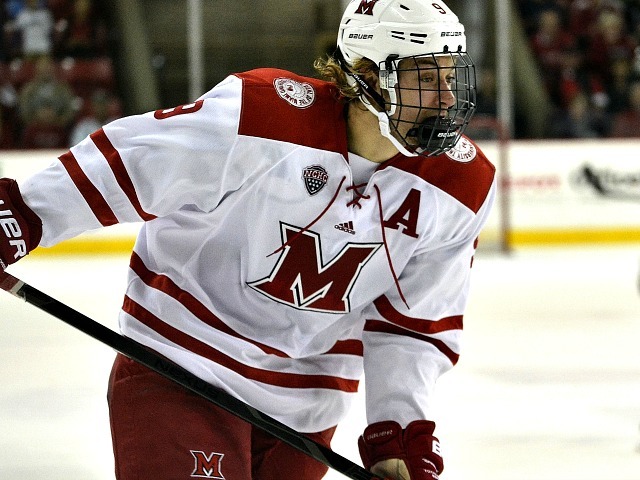 Nebraska-Omaha’ top D-man, Luc Snuggerud, lead his defensive corps in points with 18, lighting the lamp four times. Goalie Even Weninger returns between the pipes for the Mavericks, having gone 13-8-0 in a team-high 21 games a season ago. Weninger will have freshman netminder Kris Oldham looking to split time in the crease for the Mavs. Nebraska-Omaha have added seven freshman to join the already young program. The Mavericks will only have three seniors for the 2016-17 campaign, while piling up 17 underclassman. 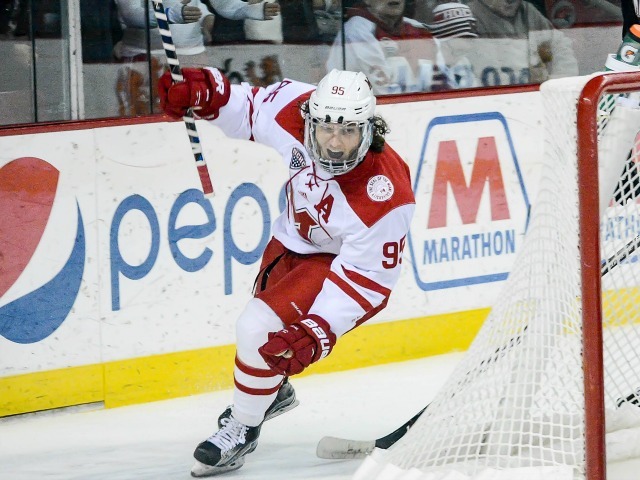 The Mavs jumped out to a great 6-0 start last year before dropping their final eight games, including being swept by Denver in the NCHC tournament. Nebraska-Omaha would like to play better in the third period of games, as they were outscored 39-26 in the final frame.